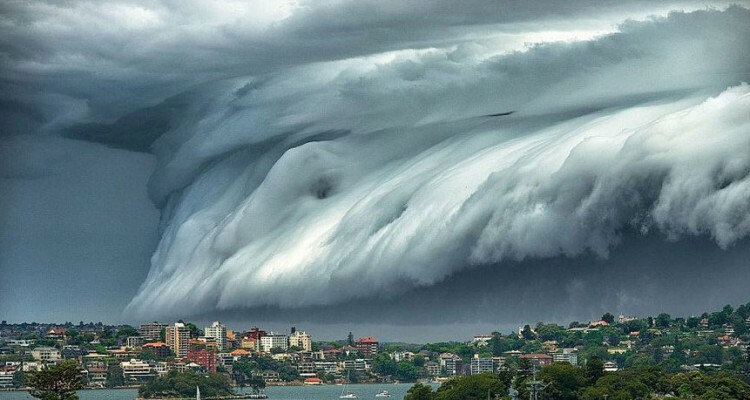 These ‘tsunamis’ are formally known as shelf clouds. They are several-kilometers long and span across the entire sky. These mighty formations are as dangerous as they are beautiful, known to be accompanied by heavy rainfall, gale-force winds, flash flooding, and large hailstones. Shelf clouds are created by a cold outflow from a thunderstorm lifting the moist air very abruptly. When the rain from the thunderstorm comes vertically down it drags the air with it, it spreads horizontally and forms a gust front, and you get the humid air being lifted abruptly from the outflow of the thunderstorm.